Joyce can equip machine screw jack models between 2-ton and 150-ton capacity and electric cylinders with an encoder to allow accurate position sensing within increments of 0.001 inches. The encoder combines with your control system to monitor screw travel, number of revolutions, and travel limits. Joyce’s shaft-mounted encoder offers easy installation, proven reliability and virtually maintenance-free operation. It includes a six-pin connector, worm shaft coupling, and mounting adapter. Standard encoders have 200 pulses per revolution. 1. 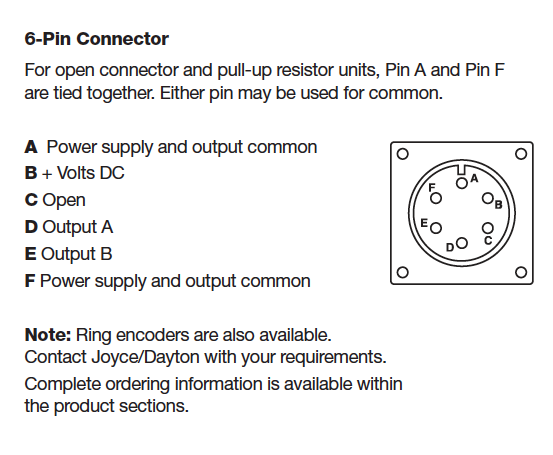 Mating connector cables can be purchased separately - length must be specified. 2. 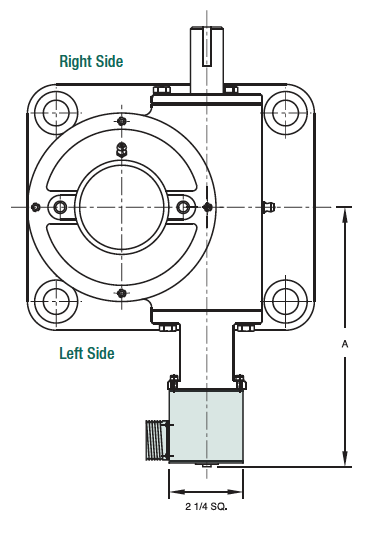 Ring encoders are also available for direct drive jacks and actuators. Since encoders (ENCX) are mounted directly onto jacks and actuators, they are specified as part of the complete part number. Refer to the ordering section for the products on which they will be used. Drawings are artist's conception - not for certification; dimensions are subject to change without notice.